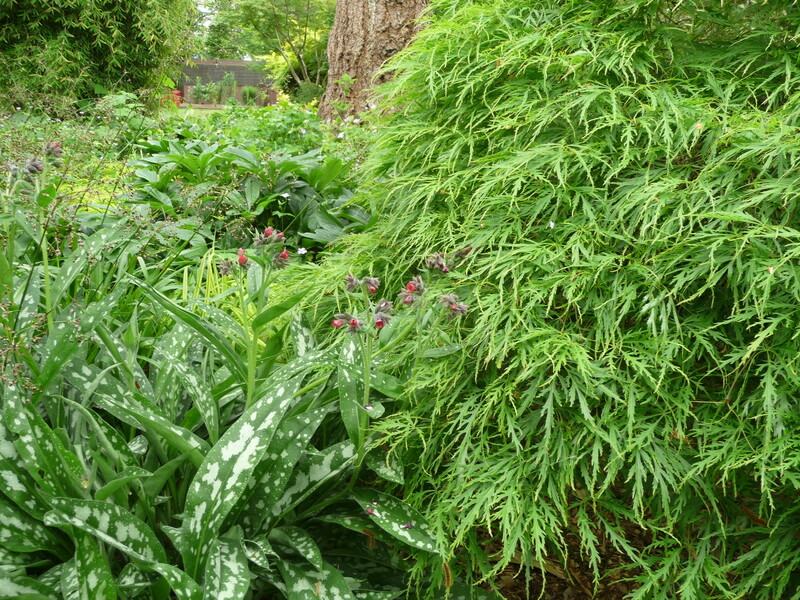 This Spring and early Summer, my garden has been exceptional. 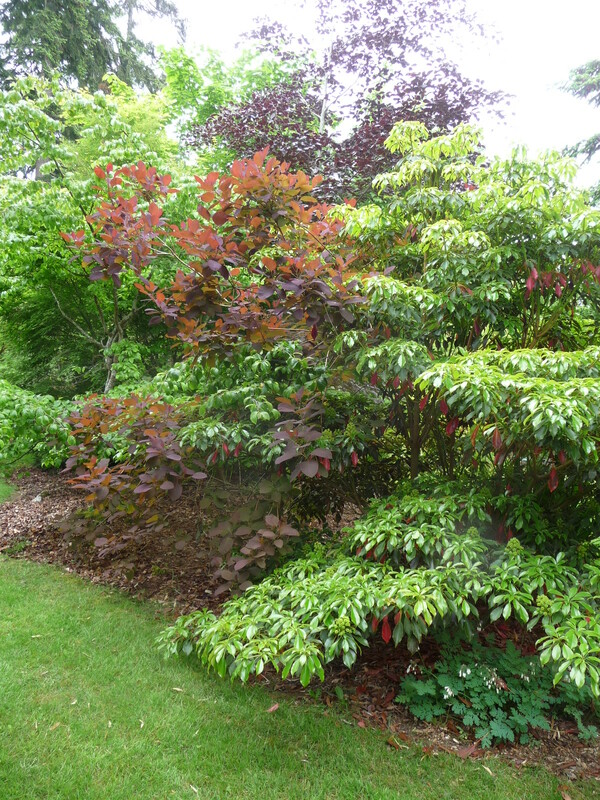 Thanks to the removal last Autumn of a number of over-crowded trees, and to the hard work of Nancy-the-kickass-gardener, it looks better this year than it has in many years. 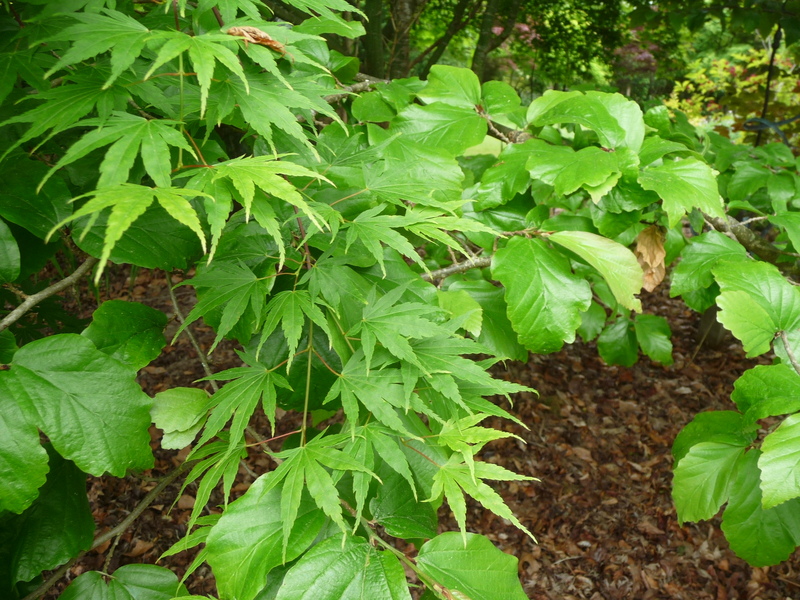 I’ve enjoyed more than ever simply wandering around, noticing. Close to, or seeing a big sweep of it, it’s a feast for the eyes and the imagination. 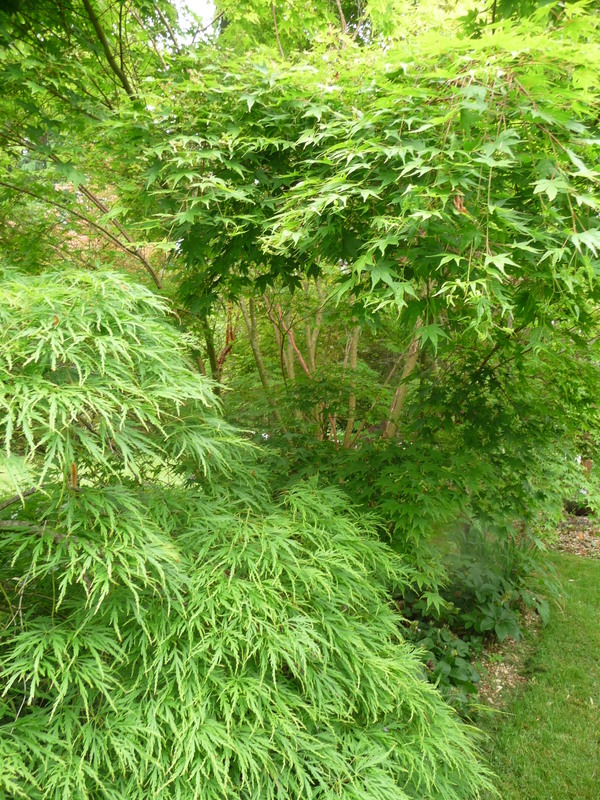 You may well wonder why so many pictures — again — of the garden. Fair enough. One day, while I was out for my morning walk (not in the garden), mulling over this and that, I suddenly stopped cold and said aloud “Layers!” Oddly enough, I knew exactly what had burst into my mind. 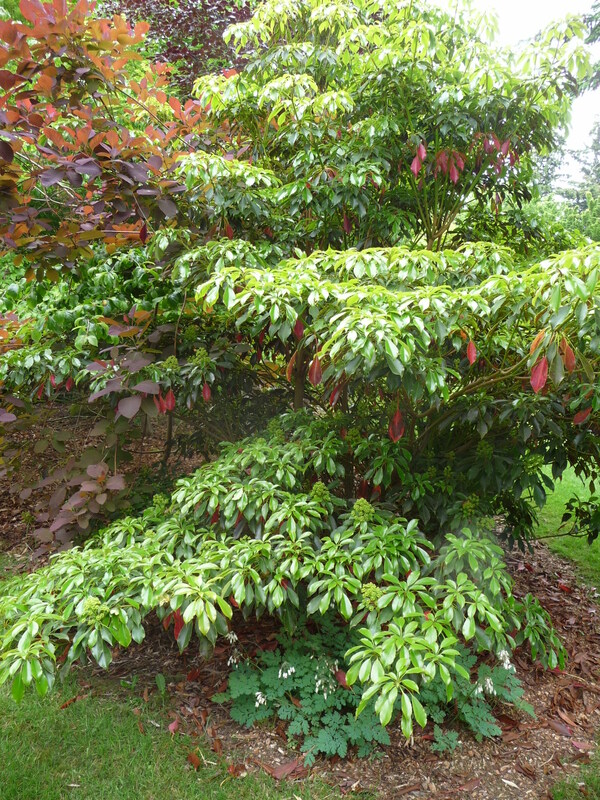 You may have noticed that in most of the photos above, so much of what you see is layered above (or below) other trees or shrubs. 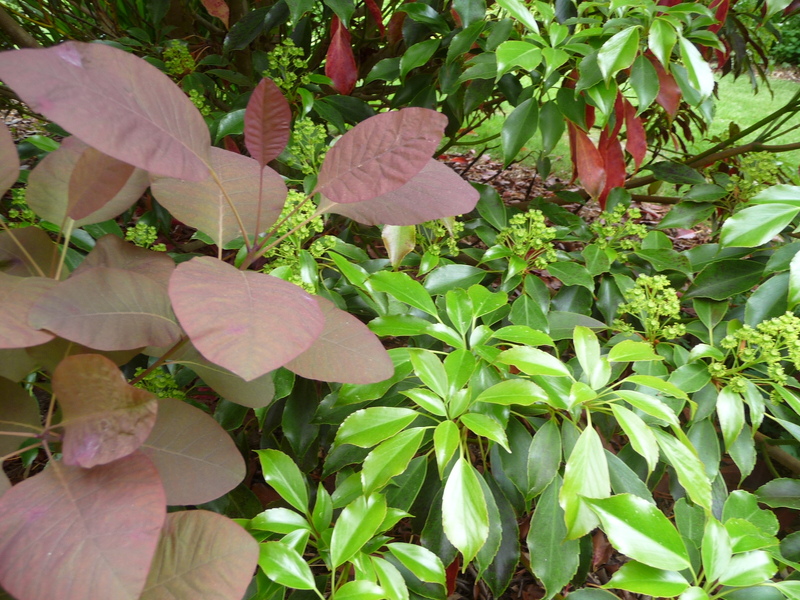 Further, there are layers of texture, sometimes of colors. 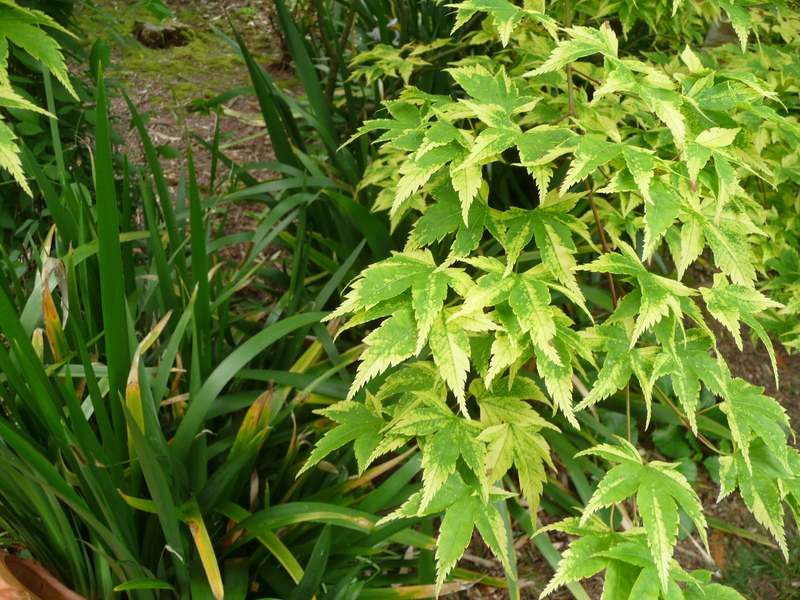 In many areas of the garden, this is the characteristic pattern or aesthetic. My AHA! moment some weeks ago was the realization that there are a number of additional ways to weave double layers of fabric simultaneously, often creating complex color interchanges between the layers and/or unusual patterning. 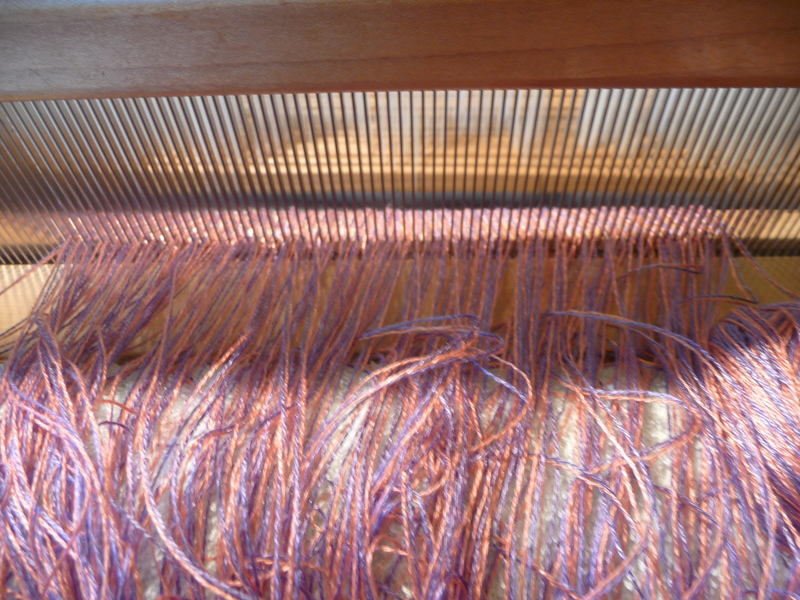 I began to do some research and studying, to learn a technique in which I’m a rank beginner, a status that after about 33 years of steady weaving is decidedly unfamiliar. And now I’ve begun the work. 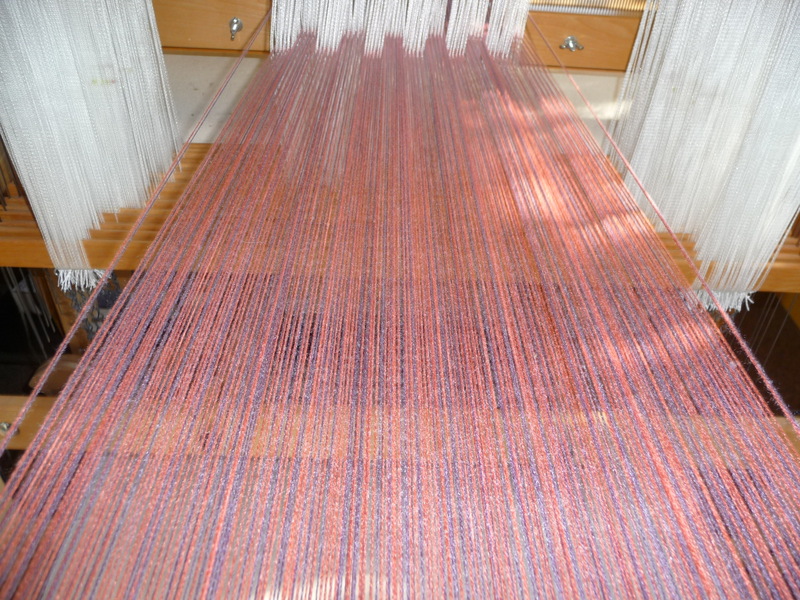 The first warp is composed of two colors of tencel yarn, alternating across the nine-inch-wide warp. 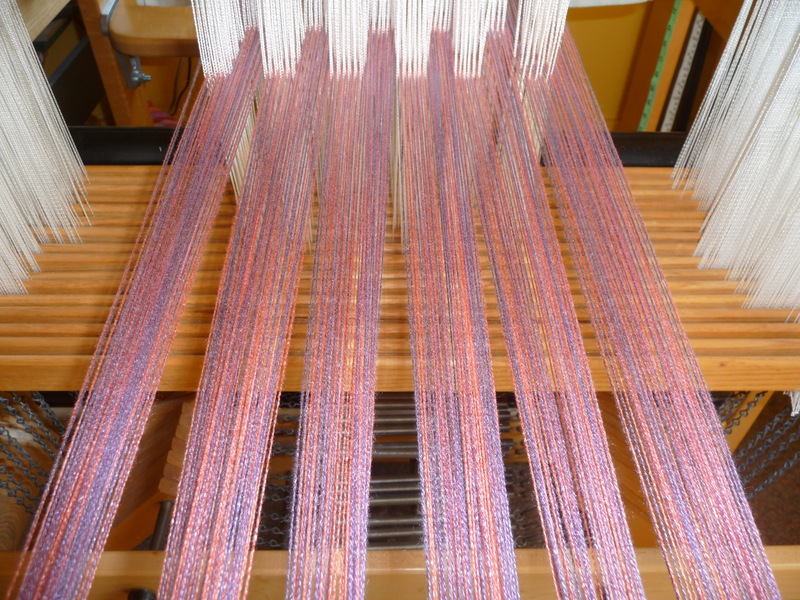 Before putting the warp threads onto the loom, I set up the entire “pattern” (called a draft) in the computer, a very different structure than I’m accustomed to. 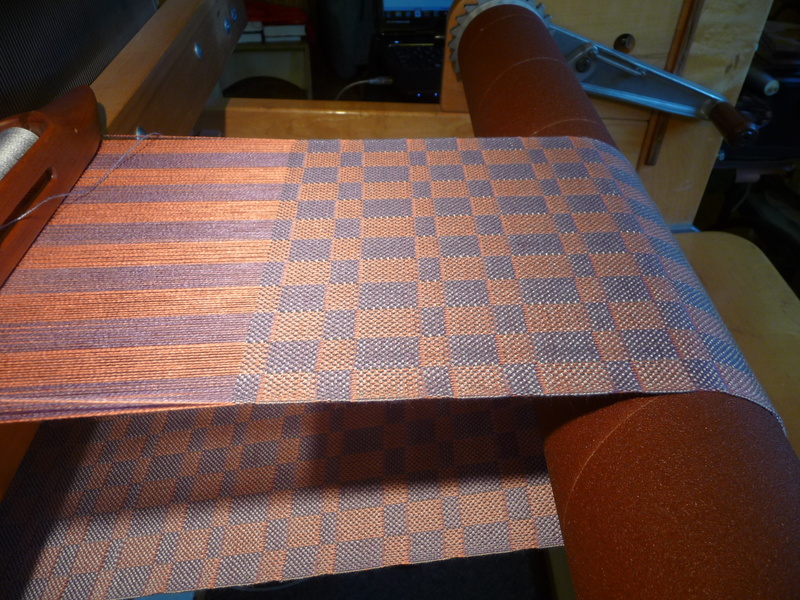 This is where the interaction of the two layers is planned out; then it’s played out in the actual weaving. 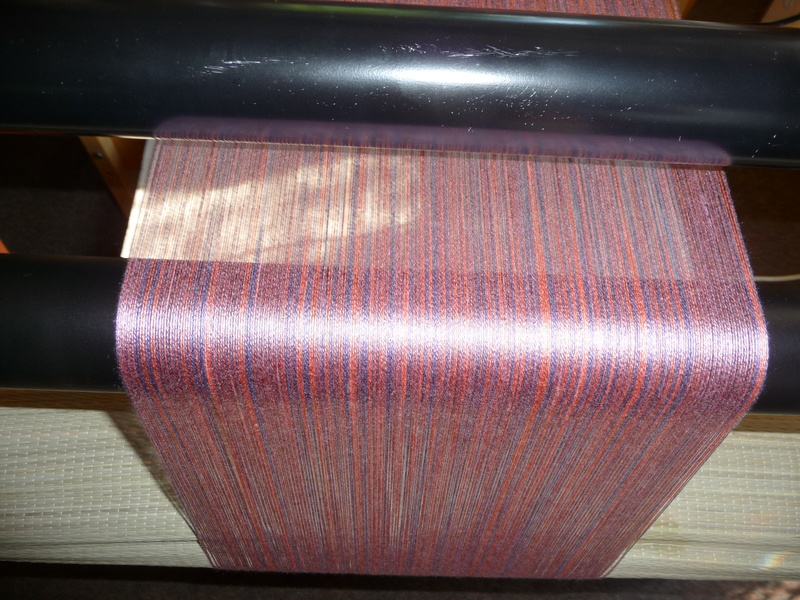 That’s the warp in the process of being wound onto the loom in preparation for weaving. Nice even tension. 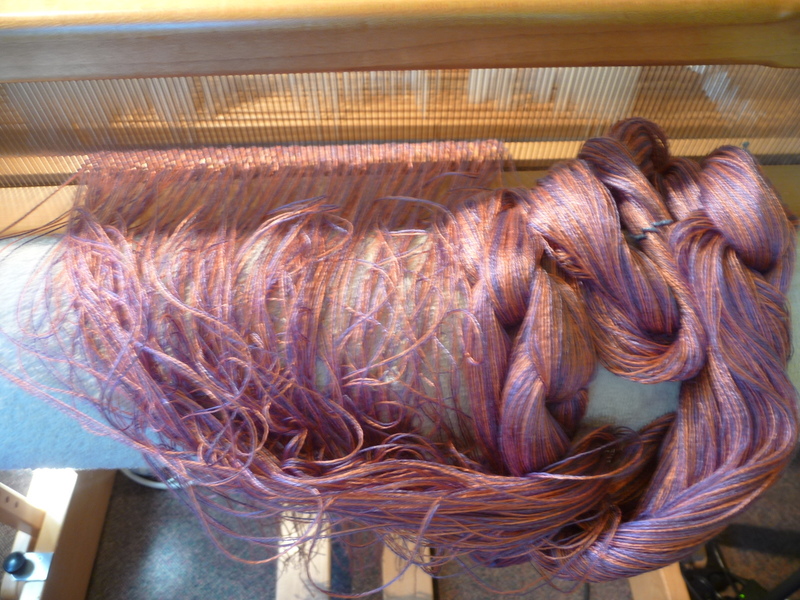 That’s looking from the back of the loom towards the front, warp wound on, evenly tensioned, ready to weave. What’s not easily seen is that there are in fact two layers there. 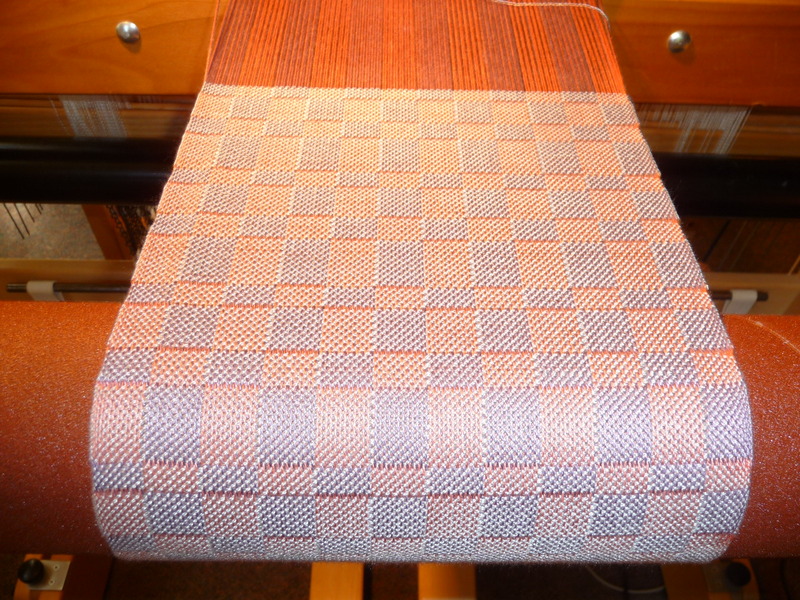 Each “block” in the cloth is two layers thick; the layers are joined where the colors change. And — here’s more magic — the reverse side of each block is the opposite color. This is the biggest darn thrill for me, and my mind is racing as I explore this new approach to weaving interesting, beautiful cloth. There is so much I imagine attempting, and I have a long-range picture of a particular way of using this technique that I believe would be unique. Stay tuned! 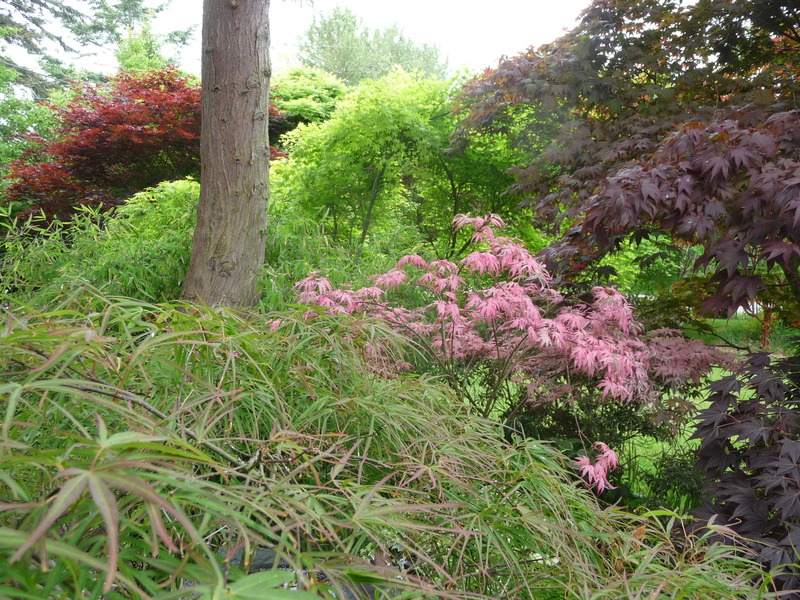 a garden I know and love so much!! I suspect the clematis and honeysuckle are luring all the hummingbirds and the crocosmia is showing its color too! Lovely! And magical indeed. Congratulations on your patient unraveling of this mysterious technique. Thanks, friend. Not altogether patient, and certainly not altogether unraveled. But on the road . . . .